I resigned from Diamond Bank on January 7, 2003. I flew Nigerian Airways direct to New York on the same day. 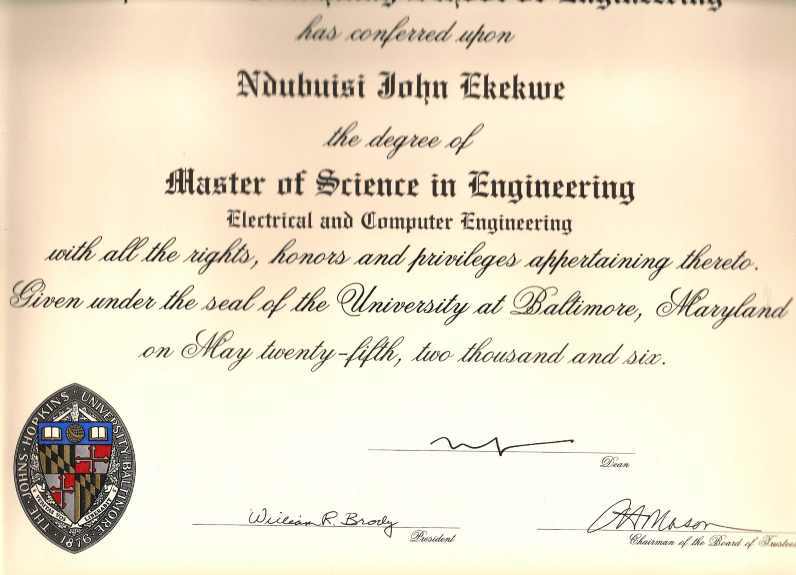 I had come for a master’s program, in electrical engineering, in Tuskegee University, USA. Few weeks ago, I had applied for a study leave with Diamond Bank. The bank declined my application. It was very painful, but I respected the decision because Diamond Bank had been supremely good to me. With no study leave, I was leaving Nigeria with no hedge – succeed in America or come back, to Lagos, to look for a new job. At the end, I made the decision to travel despite the bank’s decision. I wanted to return to electrical/electronics which I enjoyed while in Federal University of Technology, Owerri (FUTO), as an undergraduate. I had taken two master’s degrees and a correspondence doctoral program within three years I was employed, full time, in Diamond Bank. It was a very intense lifestyle which saw me one day flying into University of Calabar, from Lagos, for an MBA exam, and returning same day to work night shift in the bank’s IT organization. Everything was planned because I always had exams or certifications to prepare. Call it No Life: It was very intense. Why this torture? Diamond Bank was paying for everything. They paid for the Cisco and Microsoft certification exams. They paid for the ICAN Intermediate exam which I had added in case I had to remain in Nigerian banking. (My matrix of Nigerian bank executives showed most had ICAN; so, I assumed, to get to the top, it made sense to get mine. I never completed ICAN before I left Nigeria. But I did well in the Foundation and Intermediate phases.) Diamond Bank HR people liked me. I had my nickname “Prof” which Ohis Ohiwere (now an Executive Director with GTBank) gave me while in the training school. My goal of traveling to U.S. was to learn as much as possible, become a thought-leader, and then possibly start my own electronics design company supported with technology advisory services. The dotcom burst had taught me a big lesson: IT is a vulnerable career. I figured that electronics was higher up in the pyramid, making the systems, which anchor IT applications. And consulting could be exciting, because I would be forced to know many things, at deeper level. I decided that a PhD in electrical electronics would be catalytic in the process. A classmate during my Master’s program in Federal University of Technology, Akure (FUTA), who left for a Master’s program in U.S., handled all aspects of the admission process. I just sent my transcripts to the school and within weeks, the admission letter came. The visa process went smoothly. UK had issued me one few weeks before for my convocation ceremony in the correspondence school. I was ready for America. On the D-Day to resign, I typed my letter, which I had worked for more than three weeks. I wanted to use the opportunity to thank the bank and especially our Founder (legendary banker Paschal Dozie). Mr Dozie had a huge influence in my life. When I joined his bank, I did not know how to sign a cheque. Yes, I opened my first bank account, savings in Union Bank, few days after I started work. (Diamond Bank opened a staff account by default.) But through Diamond Bank Apapa Training School, one of the best training programs, in Nigeria, I became a banker. The transformation was iconic. But I had to leave, for America. And now, it is my turn to show the love, to the beautiful bank, named Diamond. On the day of resignation, Diamond Bank paid tons of money into my account. Money everywhere with the computer screen showing useful digits. That was the annual upfront which was always the bulk of the salary. 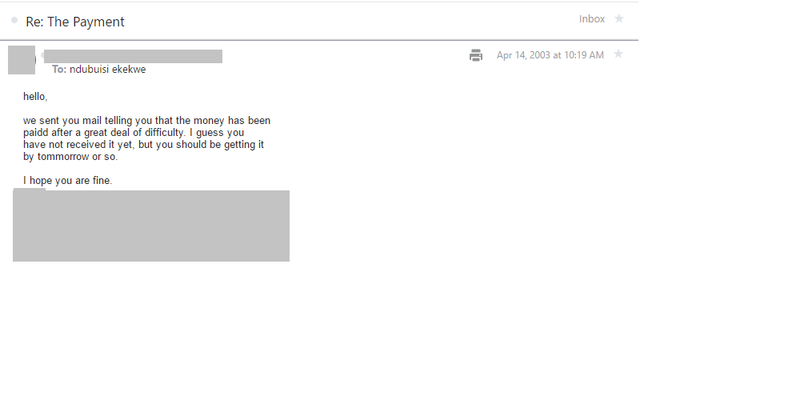 When I logged into the system and saw the money, I simply updated the resignation letter. I added an instruction that the bank should reverse the transaction as I was leaving the country, and would not be around to earn it. I dropped the letter. Most of my supervisors were genuinely impressed. Most people that resigned and traveled abroad usually clear-up. In minutes, I was off the building. My eyes turned red. I had to pay school fees in coming days in America and had not really developed a strategy than simply planning to meet the University President to award me scholarship. It was totally reckless as I practically invested all money I had in Treasury Bills and left with $400 cash and $2,000 Travelers Cheque. Then, we got confidence to attack the cold with our t-shirts from Lagos (we flew direct from Lagos to New York). 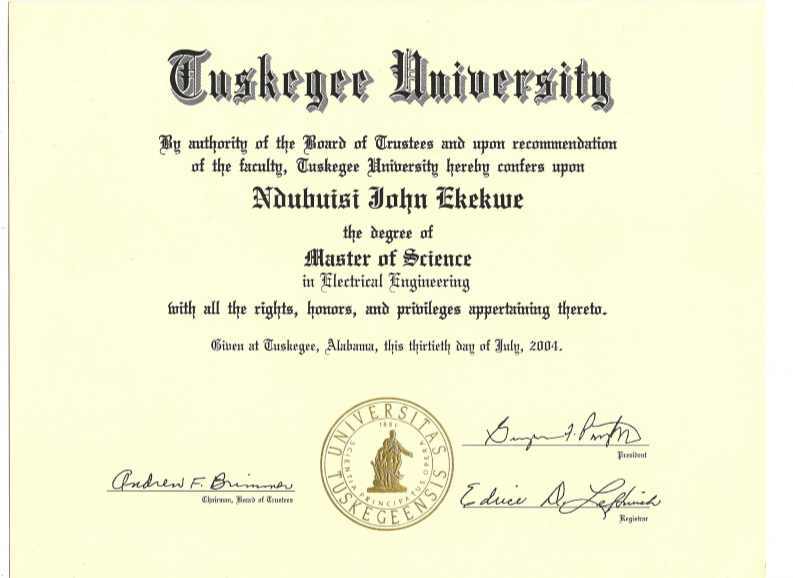 The problem was we could not pronounce “Tuskegee” in the Tuskegee University with our nice Nigerian accent. We asked more than three people, no one could understand what we were talking about. We then met one African American and asked him how we could get to Tuskegee University. I was so frightened that I could not say anything audible. The guy said “talk to me, dude. Talk to me”. Then he walked out. I was wasting his time. People, the cold had gone because something more than cold had arrived. Accent playing us here! An idea came – why not write it down and show it to people to assist on how to get to the school. Quickly, somebody told us to go to Greyhound, a bus line. I paid $103 from New York and spent about 3 days to Tuskegee on the road. It was really good except when they stopped in a cheese-eatery. I saw the thing, paid $4, and put it in my mouth. I never tasted it again. From Charlotte ( North Carolina) via Richmond, (Virginia) connecting Atlanta (Georgia) we made it to Tuskegee, Alabama. But there was a miracle: at Richmond where we changed bus, a conductor, who loaded my luggage (those good days you could carry you life) asked for a tip. People, I had no idea you needed to give somebody something for doing his job. Even if I knew, I had none, to give the guy. Unbelievable, the guy dropped one of my bags, out of the bus, at the last phase of the loading. It was when the bus was making a turn to leave that my friend Kunle shouted ‘Driver stop”. One of my bags was outside. He rushed out and put it back. That was my first lesson in America: shine your eyes. This is not Hollywood with all the smiling celebrities living in splendor and wealth. I was educated to know that Hollywood was a screen set, but I did not expect the level of poverty I saw in New York Greyhound bus station – beggars in abundance. When we entered Tuskegee, I quickly noticed one thing: every human element visible was black. I said to my friend: “boy, are we in Lagos? What is happening? I thought we came to America?” It turns out that Tuskegee is a black community with excess of 95% black population. The university is a historically black school. People, the campus is beautiful and a national historic site, meaning, the U.S. government turned the school, into a national museum. Tuskegee has history – the Tuskegee airmen, Washington Carver genius lab, and more. Ndubuisi, my friend that managed my admission had visited Nigeria and gave instructions that we should move into his apartment. I had my Ikeja CDs which I had used to setup/configure/clone computers for people, in Lagos. I explained to my friend that I would start the business immediately. Quickly, he reminded that Ikeja Computer Village CDs would send me to jail. Just like that, I was empty. No hustle. He reminded me that my visa noted that I could not work outside the campus. That was the first time I cared to check what was written in the visa about working. Just like that, the expertise from banking was muted. 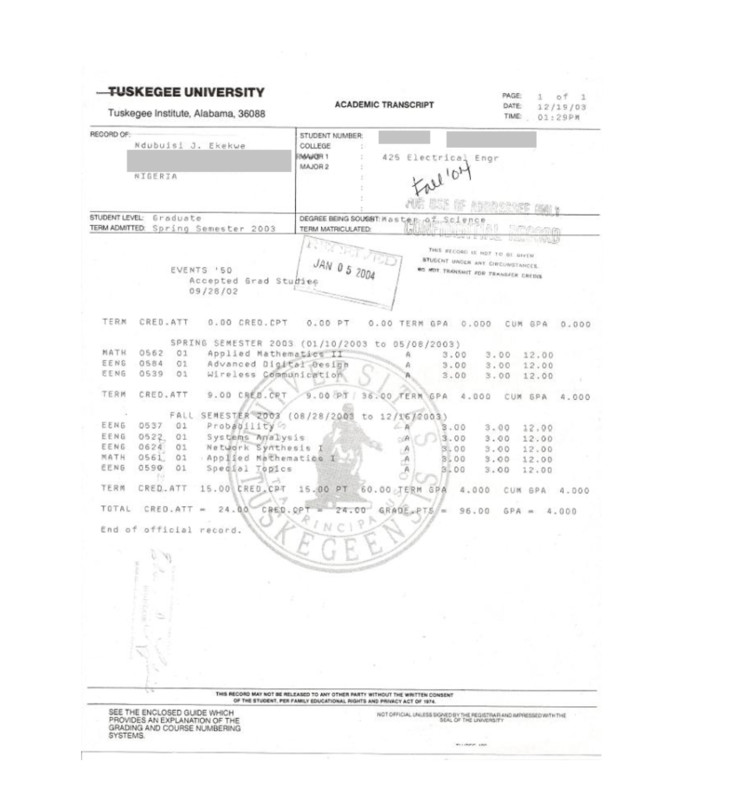 When I made it to Tuskegee University, I had school fees of about $9,000 to settle. I scheduled an appointment to meet the Chair of the department. I explained to him that I needed his support. He told me: “You need to get the bucks from Lagos and pay this school fees”. I left. The next day, I returned to meet him again. He told me to wait at the door. I told him that I wanted to negotiate how this could be managed: I wanted a job to teach so that he could pay. At the end, nothing worked. Then an idea came to me: what could I do in this school to add value to the department. At the end, I decided to craft an IT Policy with Physical & Cyber Security Manual for the department IT infrastructure. It was a huge coincidence. They were about awarding a contract on that because some people have been stealing their equipment and corrupting the PCs with viruses. In Diamond Bank, at a time, I was responsible for protecting all the PCs from virus and I knew the work very well. I spent two days working on the document, asking current students on what they knew about the systems. I went back to the Chair and told him that I had a gift for the department: he looked at me as I handed him a document. He smiled. A professor and eminently a nice guy: he asked, how long did this take you? I explained that it took me two days but noted that my career had focused on developing this type of document. I showed him a copy of my old Diamond Bank business card to give him confidence – if a bank could depend on me, the department should be fine. He offered me a seat and then asked me to drop my contacts. I did and left. As I was going back, I saw a poster for NASA scholarship. I applied. Few days later, I got it. Also, I was offered a graduate teaching assistantship. The NASA scholarship became a turning point for me in America. It opened so many opportunities. I was working on modeling high frequency and high voltage in the space environment with direct support from NASA engineers in Huntsville, Alabama. I designed a transformer that could work in the space, with the help of the research team. America is now paying the school fees. They will forever be doing because when I later moved to the Johns Hopkins University for my PhD, I got many multiples, in fellowships and scholarships. One afternoon, in Tuskegee, I received an email. The bank was looking how to send me some money and they needed a current account. I told them that I have none in Nigeria. The only bank account I maintained in Nigeria was a Union Bank Savings Account. They requested the details. Two weeks later, they sent me DHL that they could not pay into the Savings Account (that time only the account owner could pay money into Savings). They now asked me for permission to use Money Market to send that money. Of course, I gave that via email. But why send me money? Pascal Dozie, the Founder and then CEO of Diamond Bank, on reading my resignation letter, approved for the bank to allow me keep the upfront. A friend told me that he was very happy that he had trained a young Nigerian with the integrity Diamond Bank should be proud of. My GM, who was on vacation when I left, also sent his own goodwill. In 2015, my U.S. firm was invited to make a presentation in a Strategy Session. In that meeting was my former Executive Director in Diamond – Phillips Oduoza, then CEO of United Bank for Africa Plc. When I took the podium, I greeted him, and thanked him for a favour many years ago. He was the ED, Operations & Technology, when I was in Diamond Bank; he ran IT where I was one of the foot soldiers. He asked one question and quickly recollected that he got my letter and he pushed for me to keep the money. Seating not far from him was Mr. R. Awo-Osagie, my former Diamond Bank boss, now the CTO of UBA. Right there, they praised my integrity and all the Directors in UBA quickly had a positive view of my person. As I left that day, many came and commended that spirit for Nigeria. Needless to say that I received the consultancy job,despite the presence of many MNCs that competed along with me. I am truly honored. Life revolves around. You cannot afford to lose your integrity despite any situation or condition. All my colleagues in bank trust me and they continue to assist my business. I walk into offices; people that knew me will say “If he says YES, believe it”. And to Lagos banker, Pascal Dozie, he is a legend to me. I pray for him. He built a generation of people through Diamond Bank. He taught me humility in life. He was a man so exalted, and yet humble. The Diamond Bank training school is the best training I have ever attended. The recommended books, including The Richest Man in Babylon, shaped the core of my personal financial strategy. He invested so much to have leaders in banking and community. I admire him. And in all, thank God. Absolutely, that is the only option. Integrity brings personal confidence. I do hope my story will inspire young people in Nigeria. Your Story really touched me and motivated copiously. I have always admired people of your cherished zeal and always want to mingle with them. I sincerely wish we could establish friendship but I doubt the possibility due to mobility disparity. Thanks for being a blessing to your generation. Wow ! This is awesome really worth sharing. I hope one day I’ll be able to get you to attend one of my digital seminars and inspire more youth. Thanks for sharing this masterpiece. Thank you so much Ndubuisi. This story will go on to touch many lives. I have been following you for a while on Linkedin, all the while wondering how you managed to get access to some of the high-profile places you often refer to. The lessons here are numerous. God has lifted you sir, and I believe the disposition of your heart also helped attract benefactors to you at the right time. You will know even greater days and bigger platforms to unleash the humongous potential inside you. I wish you the very best sir, and someday not too far, I hope to meet this awesome person that you are. Awesome. I’m inspired. Integrity indeed is priceless. Thanks Charles. He had indeed blessed beyond measure. Integrity is the to a better world. Great write up, this should be in a book for many to read and learn from. Keep Soaring.. Your story is absolutely intriguing. That was a big risk and stretch of faith when you started your program without knowing where the school fees would come from. Just adding value to your department opened doors. Keep telling your story and you can imagine how many African youths you would influence. Keep flying that flag, Bro. Yes, it was a big risk but I was very sure, before I left home, that if America was truly a country of merit, it would not be hard to crack. The reality was if the Chair had not helped, the Dean will do it. And if the Dean did not, the President. And if the President did not,, maybe someone. My optimism in life is unbounded. But where it gets so critical, I could put order to sell my treasury bills and car in NG. Prof, I know you, and have also been one of your clients, your integrity is unequalled. your customer care relationship is perfect. Was glad knowing you and your company. kudos. Thanks Sir – we remain thankful for serving your business when you gave us the opportunity. Continue to flourish. Great article your determination and confidence in yourself are outstanding. More young people need those strengths. You were fortunate to have great mentors. Keep up the great work and it’s your time to mentor. God Bless. Hello sir. Thanks for this piece but was there Nigeria Airways in 2003? I flew one of the last trips – Kema Chikwe worked hard that day for us. What a great testimony! Keep it up Bro! Wow!!! Am I proud of you ot what ? Am utterly amazed at your ingenuity. Welldone and in outical palance twale!!! And prouder yet am I to be a Diamond too. God bless you for sharing…. In a world where integrity, honesty and diligence is becoming scarce,this is a breathe of fresh air! I hope the bank still remembers the values they stood for, the lives they shaped. Very inspiring. Well done.. You are too much.. So inspiring and mind lifting. Integrity is key. Thanks you for sharing this. May God continue to uplift you. a reflection of true life story. well done! I share your hard work and focus.keep it up!!! What an inspiring story of true grit, tenacity and fearlessness. Amazing! Great story…we learn every day. Very Very Inspiring story. A story of hardwork, self belief, perserverance and complete guts. But not all of us were lucky to have worked in Diamond Bank and have our upfront payment debt forgiven, not due to a lack of intergrity on our part but we where not just visible enough to the ED’s since we worked in branches. I admire your dexterity and work ethic from ab initio, your drive, ambition and vision is truly endearing. Please accept my Linkedin Connect, i need to learn from you. Great to know Diamond rewards with impacting values. Ndubuisi. This is a very inspiring story. But i am not surprised at your success and achievements, though I may not have seen it at this level but you sure displayed exemplary character and attitude to life and work while we were in Diamond Bank. Keep it going man. Thanks Moshood, you were one of the finest operations czars in the bank which inspired us for many great things you did. It was a great honor working with people like you. I think people like you served your country with honor because the bank seeded many leaders. DBL alumni continue to have good presence in our world. Moshood will pick a college graduate and within 6 months, the guy can run a bank operations. The focus to train, educate and lead was iconic. Thank God for your determinations, thank you for staying put on integrity and good name, thank God for the men he has used for internet and others that made it possible for the world to connect irrespective of colour or race, and thank God for the heart giving to you for sharing your experiences. Your experiences are eye opener to those who aspire to make it. Truth is scars, and I deeply appreciate your sincere and various contributions since we connected. Sure Benny -I do not always go personal like this but I have been so blessed that I decided that I could share parts of what I have learnt on the way. Nd nwanne m, im really proud of you and what you have achieved thus far. My Father always told me that the reward of integrity may take time but when it arrives, it comes with a bang!. Keep inspiring the next generation, and good luck with everything. Ndu, this are great lines of reality ….keep the spirit up ! Thanks for sharing…truly refreshing and inspiring! ND, this is really wonderful and very inspirational. A challenge to all the youths. A call to stand up and decide to be upright. A very big lesson indeed. Integrity is second to none. Tanx for sharing this inspirational story. Really inspiring. I never knew Diamond Bank was such an excellent place to work. Honesty, Integrity and hard work always pays (though it may take time sometimes) You looked out for a need in the School department and met it and that was the beginning of provision. Rendering service pays! Congratulations!!! Thanks Yinka. I have worked in great organizations around the world. The Diamond Bank I worked for remains peerless. Thanks for this inspiring story. Its quite hard and tough building a life of integrity. I mean tough! But it sure pays on the long run. Pls keep the inspiration going. thank you bro you have always been an inspiration and motivator. thanks. Very inspiring. Thanks for sharing your experiences thus far. Chi,it is because of people like you that I left Diamond Bank. Too much negative energy. Your critique of the writer’s English is appalling and a review of your own English shows serious shortcoming in itself. Diamond Bank is a great organisation. It offered many young people the opportunity to plan and achieve their career, personal and financial goals. It is up to you to be good at your job and take advantage of the opportunities to progress towards those goals. If you fell short,you were shown the door as the bank is not Santa Claus. I suppose that you were amongst the loosing bunch. Regarding his achievements in Diamond Bank, this article isn’t a resume of his work in DB. If you really want know the value he added to bank,you can place a call to PGD or Philip Oduozua or Moshood Adelotan to give you a detailed breakdown. Regarding winter in New York, if you are coming there for the first time from Nija,no amount of padding or dressing will prepare you for it. I have experienced it as I thought I was well prepared until the weather hit me big time in the face. I had to get some proper winter gear from the local shop around to blend in. So Chi, I don’t know your department or role in DB, if you had a horrible experience there, you cannot blame someone who excelled in his role and took full advantage of all the rewards the bank had to offer. Look within yourself and find out where you fell short in character,attitude or technical competence and enhance yourself in that area. Cheers. Ken, thanks for taking this up before I got to it. Have a great day. I think Ken has responded well on your behalf. It’s an obvious case of a very bitter person, so we ignore. Your story is inspiring. While I was reading about you, I remembered a friend like that in Gtbank too that has excelled in IT due to his commitment to excellence and integrity. I wish you the very best in all you do. Chi, nice one – you have completed the work. My apologies if the English is poor. This is a personal blog and not an academic thesis. It was casually written. Please have peace in life – it helps you bring out more energy. This is not APC or PDP. God bless. I agree that some people are mostly inclined to making negative/destructive criticisms…instead of constructive ones. Apparently, you fall under such category. Criticism itself is not a bad thing. Infact, it is a powerful feedback mechanism which brings about improvement. However, the motive behind it matters alot. What is the motive behind yours? 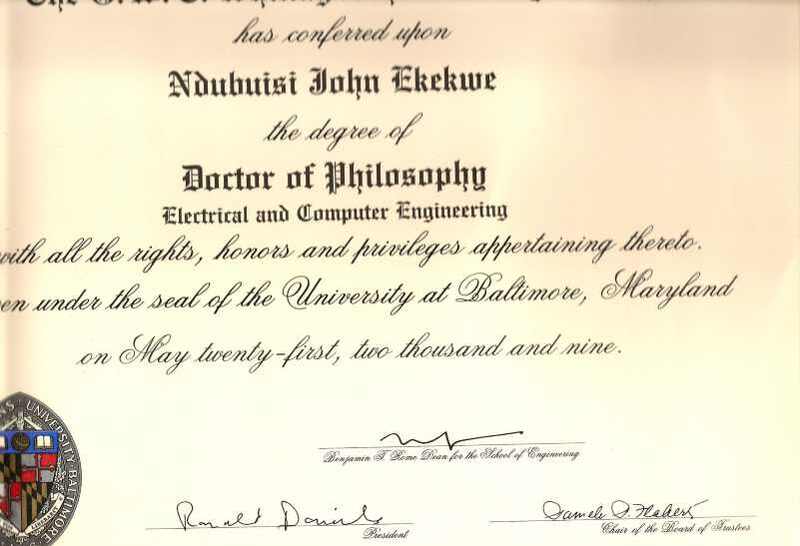 All the arrays of certifications and academics qualifications mentioned in his story, including those whose soft copies you can see, up to professorial level were all gotten via English language both in Nigeria & America. Even with his “poorly” written English. Now that we all know what didn’t add up in his story. I had expected you also stated what added-up. Or is there non at all? What lesson have you learnt from this story? What value/quality have you picked from his experience?? Is there non at all? This is humbling. A true proof that hard work and integrity can take man to the top of any career he choose to pursue. Thanks Ndubuisi for sharing this wonderful story. This is one the best endorsement Diamond bank can get among those that read this piece. The vision of the founder the must strive to propagate. Thank you. Thanks Philip. I am hoping that we normalize integrity. That being honest does not mean one is stupid. I am very speechless and Inspired by your story. You are truly a great man. What does not break us, will make us. Humility and Integrity pays. Thank you. What an inspiring story. I kept asking myself rhetorical questions as I read your piece. It is a wonderful thing to have integrity and be hardworking but the question is “How long do you remain true to these values especially when they don’t seem to pay off”; my answer, “you don’t ever give up on your values”. Adeniyi, absolutely – being normal should not be time-bounded. If we normalize integrity and honesty in Nigeria, so that people that commit to those values, will not be seen as being stupid and not “sharp”, we can build a great nation. Thanks Ndubuisi for your inspiring story. I recall the name though I can’t place your face. Diamond bank was indeed special and remains the best bank I worked in. One of the greatest gifts the diamond experience imparts in one is the capacity to endure. You just know that you can excel anywhere! you went through a great deal of difficulties but you never gave up. Yes your front runner is Integrity but there is more to your struggles. You never gave up and you believed in yourself. Man I humble myself when I think about your struggles. Well written article and God bless you. Truly inspiring story of doggedness, resilience and self worth. This is astoundingly awesome! Wow,this is impressive and worth learning from,integrity is key anywhere we find ourselves. I am truly inspired by your story and I believe that your zeal for excellence must have had a supernatural backing. I am also impressed by your appreciative and reflective heart. You are meant for the pyramid top and the sky is your spring board because such as you who remember their background and the people that helped them can only hope for a good life. I wish you the best and I am truly blessed by your success story. Thank you very much for the kinds comments. I think men and women are born to help me, always. It makes one see the world as an ecosystem of optimism and love. Thank you so much for sharing your story. Simple, yet inspiring and powerful. Honesty & Integrity indeed pays. Thank you and God continue to bless you. Thanks – He continues to bless beyond measure. Thanks for this great piece. I’m re-inspired to keep up the spirit of integrity, hardwork, and honesty. Very inspiring piece Ndubuisi. Thank you for sharing. Brilliant guy. Nice, Guardian needs to run this. Congratulations on all your achievements! Nowadays, success stories with the values you have espoused such as the spirits of positivity, perseverance, integrity, etc. are rarely shown/told to the youth or to remind even the old, what we need to build a society and indeed a nation. Many thanks for sharing! These values must be imbibed right from home and constantly reinforced to mould the child into a stellar human being. Ndubisi, no I will call you Bisi, lol. I like the part where you showed awareness and determination with the Chair of your University. You found something that was of value to the IT dept at Tuskegee and you turned a corner. I pray a true and appreciative voice like yours finds its way to larger platforms to influence the young and old alike in our society. In testament to your character, I also notice how you have continuously acknowledged people who posted comments to your article and some contributors have even risen to your defence or to reaffirm your experiences. All the best Bisi. Lol! Wow o! What an inspirational story of hard work, success and integrity. We are so much proud of you Sir. You have represented Nigeria and Africa in the best light . I read your article on Fintechs and Banks, and I knew I had to connect with you. It was/is very clear to see that you have ‘IT’ in you. Not InfoTech o, but the type of ‘it’ Peak refers to. And reading this now, just puts a personal angle to it all. Thanking God for your life, the successes and favors you have enjoyed so far and praying you receive more. It really isn’t hard to crack at all, hardwork, diligence and integrity is really all you need to excel in the US. Unfortunately a lot of Nigerians do not believe it can be done any differently than it is in Nigeria. Many thanks for sharing. I believe it goes beyond hard work but Intelligence and expertise in your chosen field. More grace for you in Jesus Name, Amen! Thank you Ndubisi for sharing this amazing story, I’m hoping more young people will read this and gain valuable lesson from it. Thanks – together we can normalize integrity as a way of life in Nigeria. This’s really beautiful and insightful, I commend your integrity and resilience. A personal challenge to me. Thank you for sharing this. My Brother. It was good you put up a fight and determination that end up to be a successful story and other young ones can learn something from your experience.I enjoyed the beginning and the happy ending. Thanks to God. Thanks so much for sharing, you may never realized fully the impact this kind of article and living experience could on people out there. Thanks once more, I am inspired. Thank you very much! A real inspiring story of integrity and relentless hard work. Wow! This is all too inspiring. Thanks for sharing. It’d be an honour meeting and learning from you. Sir, I have gathered enough facts from your experience. Determination and focus can do magic in life. Integrity may not be everything, but it better be. Thanks a lot. We need to make those elements seem normal. Ndubuisi , you are a great FUTO alumni. The blood of FUTO runs in you, we are known for great achievement. Keep it up. We shall meet one day either in Nigeria or in America. Our training in FUTO is not in vain, a good foundation for all of us. Tough school, Tough students with bright ideas. Great true story, integrity always pays. I encourage most Nigerians to “copy” from you. Wow! Life truly revolves. There’s nothing like having your integrity intact. Even though the training school I passed through may not be exactly as it was in your time, efforts are still in place for continuous learning and development. Diamonds are still groomed to be leaders in all field. You are right. PGD, Diamond Bank Founder, built a generation of leaders in Nigeria. Just read Ndubisi’s story through your BC, James. Thanks for sharing. Ndubisi, your story only reinforces that focus, integrity and having the right mindset can spring board an individual to the place he wants to be. I appreciate your willingness to share your story to inspire people to do beyond their capacity no matter the situation and challenges they face. Keep the flag flying and do come home to build businesses and systems that will ensure the growth of young people. Many young people need proper reorientation of the definition of success. I personally believe that working in the right organization with the right people will expand the capacity of an individual. Seems DB has gotten it right in some way, please share so we can learn how to build organizations that will stand the test of time. Dear Bolaji, sure that will be another long piece. If you contact me, I will be happy to share. The email is on the site Contact Us section. Many thanks to you Ndubusi for sharing your life experiences. Indeed integrity pays and as someone earlier replied , its PRICELESS. Yours is a lesson on the well-deserved dividends of honesty , commitment, integrity and sheer hard work. I have learnt a lot on this timeless personal piece. You started well…. ended great… well-done !!! What a wonderful piece. I wish I could live longer in your memories. It was beautiful, motivating, exemplary, and patriotic. Took note of how you worked for 48 hours. Nowadays, we can hardly find people who will commit as much as 12 hours of work. America is truly a land of opportunities and I’m glad you made full use of the opportunities for personal and career development. Today, you are inspiring me and fellow Nigerians to be excellent in all what they do. Most important lesson from your story is that you get rewarded in life when you add value to other people. But before you can add value to others, you need to add value to your self first. But you cannot give what you don’t have. Thank you for sharing sir. God bless you. I probably need to start all over. Where can I find mentors like you? Practically read all of your posts on LinkedIn. This totally had me. Thank you for the lessons shared. I Love your success story and laughed intermittently. I thank God for your duggedness. Also your value for integrity is challenging. I have saught to know your story for a while now, having followed you closely on LinkedIn. I am on my own journey and can relate with your story. I’m so terribly inspired by it! God bless you indeed for sharing. This is indeed a great read for young lads like me needing to make a focus and find a good feet in today’s tech society. I have been following your write ups via linked in. And when I wanted to get an internship as a graduate, I checked your profile several times. It became an enigma as to how a Nigeria could achieve so much in a short time and attend a tier 1 university, with a Nigerian undergraduate degree. I was surprised by the mix of banking and engineering,and I did not still believe you studied in Nigeria whilst I read some on your articles. I think we need people like you at home to galvanize young ones trying to find a feet. Now the question,how did you handle three post grad degrees + a full time job, though I know tech is existing and it pushes you to keep working until you resolve. Further more, how was it easy to excel in the US especially with engineering where they are far ahead of us,because I know our curriculum is obsolate. It will be nice to have you as a mentor, possibly be my own pascal. Thank you and let me hear from you. Cheers sir. Thanks Oluwatobi. Connect with my team via the email on contact us. I will make time for us to skype. If there are ways I could be of help, let me know. As I read this piece this morning, I couldn’t help the tears from flowing. Do you know why? Before I started reading this article, I went through you profile cos you mentioned FUTO in your 24room Mansion posts and I was surprised that you had your first degree in Nigeria and started your career in banking here in Nigeria. What now made me shed tears is this: I am very sure that some people (friends/colleagues) would have laughed at you or discourage you at a point in time that why are you wasting your time on all these reading up and down; typical of we youths of nowadays especially bankers. I just imagined you giving in to their pressure and where would you have been by now, probably still in DB as an officer or in another bank probably as AM that is if you are still even in the system. 1-Keep the right friends i.e. those ones that share the same dream and vision with you or ahead of you on the path you chose. in this case Kunle and your friend that assisted with the admission. 2-Dont ever back down on your dreams and ambition no matter the discouragement from friends and colleagues even family members. Just imagined you gave up cos you don’t tuition fee before setting out. In summary, you only see barriers when you take your eyes off your target. In a way Igwe, as I will start calling you, I am convinced that I am on the right track and no one will discourage me.. Very inspiring story! Thank you for sharing your experience. I will share this with my 13-year old son who is interested and already doing some training/courses in IT. I am sure this will inspire and motivate him. Integrity, hardwork and dedication truly pay. God bless you! Every Nigerian including my good self should be proud of you. I really do want to go to school to get M.Sc and Ph.D. but that dream looks like it’s not gonna come anytime soon. Reading this story has given me big hope. My people, I need the scholarship to go to school I want to read and change Africa. This salary life isn’t for me. Very Inspiring Prof. Very similar experiences with me but i am just starting. I was also in IT Department of one of the leading banks in Nigeria. I just relocated to the West and hope someday, i will tell a story like this. Remain an inspiration to all! Good luck – make it happen. I literally managed to hold my tears as I read your testimony. In every stage of your life, God continually perfected all that concerns you; causing men, situations and circumstances to work in agreement to not only favour you but to attend to all that concerns you. Your life is a testimony of grace. Your diligence is incomparable, and no wonder God continually rewards you in a special way. You are an inspiration. Thank you for devoting your life and saying yes to your inner man as God leads you in taking bold steps in your pursuit of excellence. I make bold to say that you are already ruling the world because your life is impacting a generation that would stop at nothing in their pursuit of excellence like you. I can’t thank you enough and I am eternally grateful to God for connecting me to you. Thank you again and again my Prof. This is quite encouraging. Your type is rare. You keep learning and empowering the society and the world at large. Your ethics, morals and educational disciple played and still remained a vital role to your continual achievements. Awesome – thank you. I would surely share. We do expect some opening later in the year and would share. Very inspiring post! I had to read to the end including the comments. Good afternoon Sir…..read your write up and am inspired by your Life .Am into IT too but like you said its Vulnerable .Am thinking of Taking Master courses that exist at the pinnacle.Considering Systems Engr…. Thank you for all you do . Less i forget .I Graduated from FUTA computer sci. Good luck and make it happen. Thanks for this. Since i heard you speak at NIGCOMSAT in 2009, i have been wondering how you did it. Now i can fight the good fight of greatness. Prof, this story is really inspiring. I read an HBS article you wrote a while ago and haven’t stopped reading your materials. They are laden with unmeasured depth. Keep flying! I sent a linkedIn request and will be most grateful to connect with you. Thanks! Prof. your post has been inspiring but I am more inspired by your story to stardom, I learnt that integrity, dedication and never- give up attitude pays. Congratulations to Diamond bank for making you pass through them and be one of the rare breed professionals. I am your follower on Linkedin, I am being expecting to read your story and I finally did. I am more motivated and believe I can weather the storm just as you. You are awesome sir. Have been wanting to ready story about your background and I finally did. Thank you for sharing this great and funny piece. Your success story is inspiring. I am truly blessed by this story. Thank you Prof. Your story is humbly and very thoughful – Thank you so much for sharing. We need this type of stories for every home in Nigeria. Ever since I stumbled across your write up from a contact, I knew I had to folllow up immediately cause there was something about your person. I just finished reading your write up and my brain has gone into over drive.. integrity, humble, ability to relate with people around you plus belief in God took you to greater heights. I am more than determined and focused to do my bit and make this world a better place for us all. Thank you for this eye opener, and continue in your strives without compromising. God bless and thanks for the feedback. I am happy it inspired. “I learn alot from you” Thank you. Reading this story has completely inspire me to hold firm to integrity. You have achieved so much through sheer hardwork and remain humble. i hope to connect more through linkedin. The path you have choosing in life has a lot of long term benefit both spiritually and physically.I love your story.it will refocus the future generations who find it difficult to be identified with Nigeria. Many will want to discourage you but few will encourage, never mind whats important is the content of your message. and the Foot print you have left over there. Great piece Ndubuisi. I read your write-ups and always, they are so insightful. This one got me so captivated that everything was at a standstill until I was done reading it. Once again great piece. Hope some day to dine with you and be given the opportunity to update my journal with intellectual content! Thank you Enoh for the kind words. Sure, let us connect one of these days. Awesome, you have really made my day. Integrity can serve as collateral in business especially for emerging entrepreneurs considering the difficulty of securing start-up loan in our financial institution . You have really inspired me. I’m really inspired by your piece of work. I have been following you reading your write up you are a motivator Prof. We need intellectual like you in the system to pilot the affairs of the country especially in the area of science and technology. God bless you. Wow, this post is so timely and inspiring. It really resonates with me as I prepare for my Master’s program in spring. Nothing is impossible, even a 4point GPA! Thank you for sharing and motivating! Your integrity, hardwork, desire for knowledge/skills, and determination prepared you to maximize the opportunities that came your way. Permit me to say that your timing at DB those years were quite favourable. Banking in Nigeria has evolved over the years due to stiffer regulations, fiest competition, and unfavourable economic environment. This has also impacted on banking career. You don’t get those privileges and opportunities you had at DB any longer. This is not just DB, but industry wide. Infact, most of the systems are now designed that you get basically nothing when leaving considering years and effort put on the job. How much more for the Bank to go through difficulty in sending you an un-earned upfront. However, that is not to say that one must not always seek ways to improve, be relevant and to add value to any system one find his/her self. In your story, I do not see integrity playing out much. A lot of people even get victimized at their places of work because of their integrity. You also had Cisco and Microsoft Certifications. In addition to starting ICAN before you left the country. You also stated why you went for the ICAN: to prepare you for an executive position since your survey revealed that most of the top executives had ICAN. That was forsight! That was intensely challenging and inspiring for me. Thank you for sharing! Your experience, knowlegde and skill enabled you design the IT policy at Tuskegee, gained you a NASA scholarship and gave you grounds for much other achievements that followed. Congratulations on your performances and for how far you have come. Thank you Sir for the detailed comment. I do agree that banking has changed. We do a lot of work for banks in our Advisory service. Things are no more the same. This piece is not only inspiring for me but also instructive. Thanks for taking the time to share, it goes deeper for me. Wow! What an intriguing testimony. Reading this article today, I summarized your successes on three things: absolute integrity, hard work and undiluted trust in God. You’re indeed a man of excellent spirit. Your testimony has impacted and inspired lives including mine. I am trusting God for such testimony like this. GOD BLESS YOU PROF.! Thanks Prof for sharing this inspiring story of your life. I am motivated to do more in my quest for a meaningful living. Immediately I started seeing your post on LinkedIn, I immediately fell in love with you. Other people with lesser achievements would have distanced themselves from Nigeria and anything that have to do with the country. I really love you and love your beautify heart. I’ll love to meet you one of this days when you’re in the country. I’ll love to have you as a mentor that i seriously in need of right now. People like you make young guys like us to be hopeful. Honestly, the lessons are so numerous. Starting from the maximisation of your gifting and opportunity, hardwork,humility and above all Integrity.This write up has been all inspiring and motivating.Thanks to you, Sir. You are yet to record more and more achievements.